When I first started the Pay-It-Forward Author Interview Series, I knew I would meet all types of writers from all over the country and the world. I’ve been amazed by the stories they write, their candid honesty about the writing process, and their willingness to share secrets of their craft with others. How often in other businesses do you find people in the same business so willing to help one another? The ‘secret sauce’ and the ‘family recipe’ are well guarded to keep that something special an exclusive right. I am amazed by the writers who have come to share their work – and now I am humbled by Nikki Rosen, author of In the Eye of Deception: A True Story, Dancing Softly, Twisted Innocence, and No Hope? Know Hope: A Healing Journey. Nikki has won awards for her writing, and rightly so. Her story captivated me, and it will do the same for you. Nikki, thank you for writing! Your story, In the Eye of Deception, was a heart-wrenching and beautiful roller coaster. With a website titled Write 2 Empower you clearly have a message and a mission. Would you share with us the birth of your writing and what you are accomplishing with your work? I never met to write and publish a book. Something happened that threw me back into the memories. I wrote to get the images out of my head. Strangely, I connected with an award winning author who believed in my writing and in my story. She wanted me to publish but I didn’t want to at the time. Her and I went back and forth for six months before I decided if I were to write my story, it has to be something that would give hope to others who are where I was, living in the darkness, with no hope of anything ever changing for the good. I found that writing gave me my voice, a way to ‘speak’ what I hadn’t been able to say. Not only am I amazed by your story, but your writing style is obviously an incredible gift. What kinds of resources or training did you have in preparation (or to improve) for writing? I had no training to write. I just wrote my heart. I wrote what I couldn’t speak. Now however, I discovered how much I love writing and have taken a few online courses and also a few locally. I also try to read everything I can on the craft. Especially from writers I adore like Anne Lamott, Maya Angelou, Eli Wiesel. 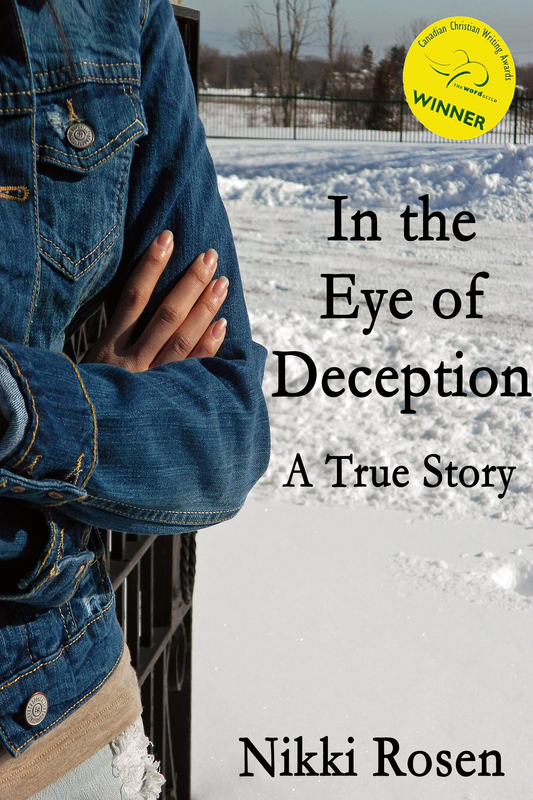 In the Eye of Deception won the The Word Guild Award and received an Honourable Mention of The Grace Irwin Award. First of all, congratulations! What was the process to submit to these awards and how has this boosted your writing and your platform? Thanks Jessica. A friend nagged and pushed me to submit the book for an award. I struggled with that b/c I didn’t think what I wrote was any good. I actually submitted it the night before the contest closed. The process involved submitting the full manuscript (2 or 3 copies) and paying something like $40. It boosted it in that many members of The Word Guild, immediately bought the book and although the book had already been selling well, I think it gave credence to my writing. It didn’t change my platform as I already had established one and knew who the book was aimed at – women who had a history of abuse, or/and trauma and needed hope. What is your writing process/schedule? Or what have you tried and revised? Writing process – I usually like to write early in the morning when the house is quiet. But the place that pumps me the most and inspires me to write is when I’m in the woods. It’s there my heart speaks the loudest. I need emotions to write and images. And when I’m out in nature, I’m not afraid. I feel alive and free. After I listen and hear, I run home and type it all up. Then I agonize over edits. I’m also part of a writing group now. We’ve been meeting for three years once a month. I value their input on my work. Many writers, especially those just starting on the path to authorship, have a glossy image of what it means to write, edit, and publish. What did it look like to you when you started writing your story? And what does it look like now? When I started writing, I had no method. All I wanted was to get the memories out of my head. Writing became a way for me to have my voice. I wrote all day, late into the nights. I sometimes forgot to feed the kids. I felt compelled. Looking back now, it was very cathartic. And very healing. What shocked me in the beginning was people, women and men, young, middle-aged and older identified with my story. They told me my book came to them as a message of hope and that if I could overcome, they could too. I loved that. I self-published my book through my university. Once I got it in my head I wanted to use what I lived to give others hope, I wanted it out as quickly as I could get it out. There was a lot of negative talk about self-publishing but the book has done incredibly well. It’s sold throughout Canada, the U.S., England, Australia, Hawaii and India. What has been your greatest moment in your writing career? To make that moment shine more, can you also share your most difficult moment? Winning the award was a definite wow for me. But I also won a couple of short story contests and have been published in a number of anthologies (5). Another couple of highlights – December 2013, someone donated $5000 to put my book into a small pocket sized edition and distribute it free to women in prison or living on the streets. 5000 copies were printed and have been shipped across the country and overseas. A few months ago someone approached me to have it translated into Russian for the women there. That’s happening now with the goal of getting it to the Ukraine by Christmas. The most difficult moment was when I was at a writing conference and a well known editor who didn’t even know my story, told me memoirs don’t sell and my book will never sell. I wanted to go home and give up. My friend was there at the conference and she wouldn’t let me. I’m very grateful to her for that. One person’s opinion is just that – one person’s opinion. A great learning looking back. Do you attend writing conferences? If so, which ones do you recommend? What internet or book resources can you recommend? I’ve only attended one writing conference – The Word Guild 2009 – in Guelph, Ontario Canada. I’d love to attend more but it’s been hard to get away as I still have kids at home and my kids are my priority. My absolute favorite writing book is Anne Lamott’s Bird by Bird. Love her style of writing and love what she says. I used to read through Rachelle Garner’s page a lot. http://www.rachellegardner.com. There’s a ton of other sites but can’t think of them right now. Please share a quote or saying that inspires you. If you have two, share two 🙂 We can all use more inspiration! Okay…..here’s a couple of favorites. “Every little thing wants to be loved.” Sue Monk Kidd.